IPV was launched as a single IM dose to be administered at 14 weeks of age along with OPV-3 in 6 states. Note: Later on, in the remaining states/UTs, IPV has been launched as Two-dose fractional intradermal schedule at 6 & 14 Weeks. What is the reason for shifting from one full IM dose to two fractional ID dose schedule? •	The change was driven by the scarcity of IPV globally. •	Moreover, WHO reports that Two fractional doses of IPV, given at 6 and 14 weeks produce better immunogenicity than a single standard dose (IM) given at 14 weeks. Hence only 0.2 ml is needed per child when two fractional doses are given instead of one full IM dose where 0.5 ml is required per child. 5. Temporarily taking immunosuppressant, as this can suppress the immune response to the vaccine. No, currently no booster dose is recommended under UIP. •	The “shake test” is NOT effective in determining whether IPV has been frozen (Because it does not contain an aluminum adjuvant). Where the IPV vaccine should be kept at the immunization session? IPV should NOT be kept on the ice pack during an immunization session; it should be placed on the table. 1. The vaccine is currently prequalified by WHO. 2. The vaccine is approved for use for up to 28 days after opening the vial, as determined by WHO. 3. The expiration date of the vaccine has not passed. 4. The vaccine vial has been, and will continue to be, stored at WHO- or manufacturer-recommended temperatures. 5. The cap of the vaccine has not been submerged in water. 6. 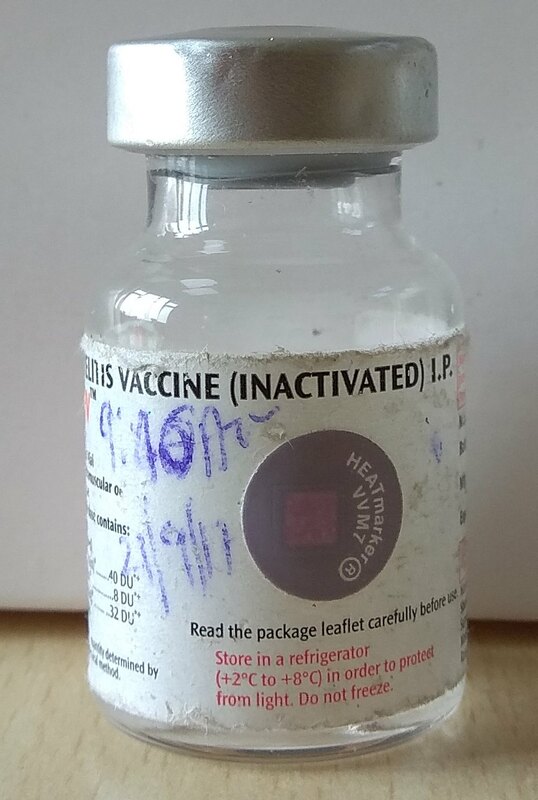 Any vaccine vial missing a label, or attached with a label that cannot be read, should never be used. 7. The vials are handled with good hygienic practices. What is the maximum age limit for giving the first dose of IPV? Under UIP, the maximum age limit for IPV is one year. What are the common side-effects of IPV? Are two fractional doses as effective as a single standard intramuscular dose? Two fractional doses of IPV, given at 6 and 14 weeks produce better immunogenicity than a single standard dose (IM) given at 14 weeks. Q. How to administer IPV by intradermal route? Q. Why was the need felt to introduce IPV in the National immunization schedule? 2. To solve the problem of VAPP and cVDPV, a step is being taken to ‘SWITCH’ from trivalent Oral Poliovirus Vaccine (t OPV) to bivalent Oral Poliovirus Vaccine (b OPV) at the global level. o	There is a risk of outbreaks of cVDPV type 2 as it is circulating in the population due to use of t OPV in the national programme. Will IPV (injection) replace OPV (drops)? No, IPV will not replace OPV, since IPV is recommended to be administered in addition to OPV. Is it safe to give IPV and OPV together? Hence to maximize childhood immunity and move towards global polio eradication, it is recommended that both vaccines be used together. 4. Pragya S, Akanksha R, Taneja DK, Suneela G (2016) Implications of IPV Introduction in National Immunization Schedule Page 2 of 3 and Strategies to Combat Shortages. Int J Vaccine Res 1(2): 3. 6. GOI, 2016. Mission Indradanush, Operational Guidelines. Ministry of Health and Family Welfare, New Delhi.